Sear and Cowen Glass & Glazing Ltd can supply laminated safety glass, manufactured in various thicknesses suitable for all domestic and commercial applications. Laminated glass is clear but when damaged it will hold together and will not collapse giving peace of mind, safety and security. Heavy duty laminated glass is installed in banks, shops and other premises that require the ultimate in safety and security. All types can be supplied and installed including bullet resistant, anti-bandit security & safety glass. 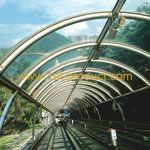 Toughened glass is float glass which is tempered through a rigorous heating and cooling procedure. Toughened glass is NOT unbreakable but the heat process creates a product up to five times stronger than normal glass. Under heavy stress it can break but will disintegrate in to hundreds of tiny pieces that don't have jagged sharp edges. We can supply fire resistant glass for installation in both residential and business locations. This glass offers increasing levels of protection & resistance from fire, measured in defined time periods - 30, 60, 90, 120 and 180 minutes. 6mm Clear Wired (GWPP) and 6mm Clear Wired Safety Glass (GWPPS) is available. These have passed stringent integrity tests of 60 minutes in timber doors and 90 minutes (120 minutes GWPPS) in steel frames. 7mm Textured (GWC) and 7mm Textured Safety (GWCS) is also available. These have passed stringent integrity tests of 60 minutes in timber doors and 90 minutes (120 minutes GWCS) in steel frames. Textured glass is obscure. 7.5mm Prolight. This is clear laminated glass which contains no wire and has an integrity rating of 30 minutes. Please contact us for information on these or any other types of fire resistant glazing.